Hummer H2 SUT Getting Bigger? The fast shutters over at KGP photography captured what looks like a Hummer HT SUT (In reality, a Hummer H2T — according to Winding Road) that's been stretched out on the rack. 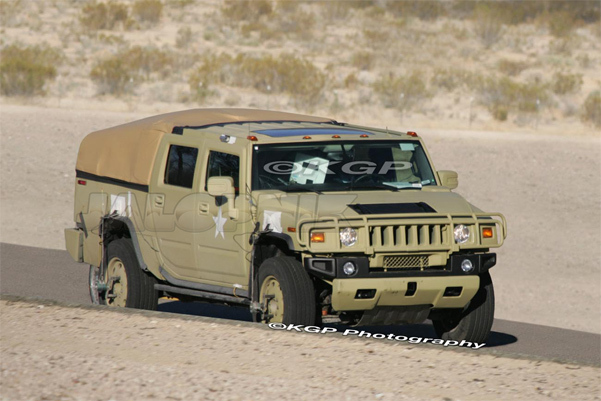 The fake army paint job doesn't fool them though, as they think that this is a new H2 making use of the stretched GMT-900 platform — the same used for the Suburban as opposed to the current H2, which is built on the same platform used by the Chevy Tahoe. This would give it real, truck-like powers as opposed to the current generation, which can barely hold more than two kegs. Full spy report below the jump: UPDATE: Winding Road's sources tell us this H2 SUT mule is actually a Hummer H2T, a companion to the Hummer H3T we expect to see revealed in coming months. hauling capacity over the compromised bed of the current H2 SUT. treatment will also be applied to the H2 SUV.